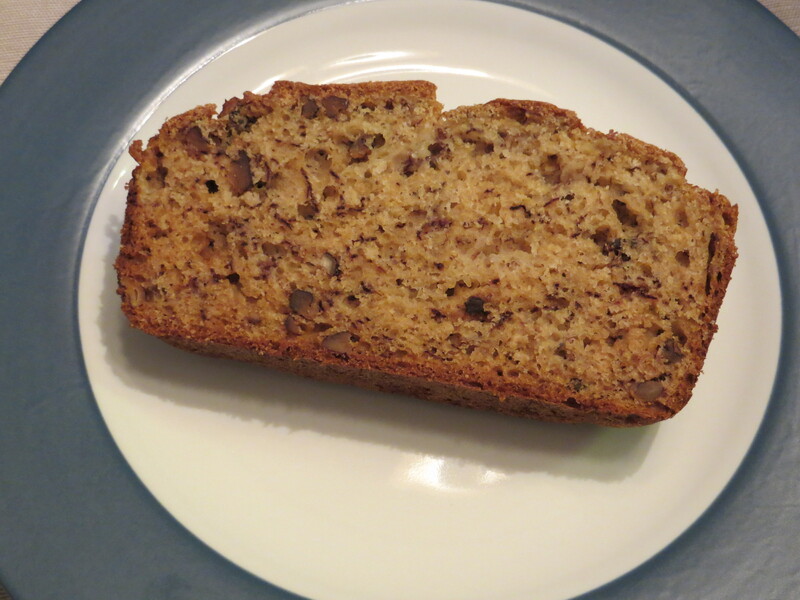 Banana nut bread is a food weakness for me, and unfortunately, it is often loaded with calories and fat. 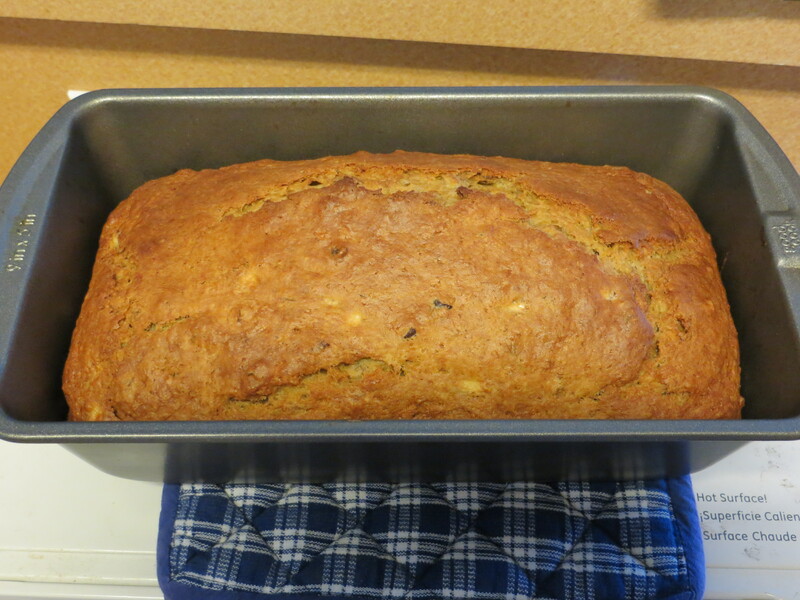 I therefore was thrilled to find a banana nut bread recipe in Ellie Krieger’s Comfort Food Fix cookbook. Ellie often can be counted on to provide healthy-yet-delicious recipes. Considering that I’ve been slightly obsessed with the Comfort Food Fix cookbook for the past week, it was inevitable that I would make a loaf of this bread. I had already started the recipe when I realized that I only had 3 medium, rather than large, bananas, so I had less than the called-for 1½ cups of mashed banana. This may or may not have had an impact on the final result, in which the bread was slightly dry. I did overcook the bread a smidge. I checked the loaf 45 minutes into its baking time, but I should have done so sooner. The top was a little too brown for my taste, and the edges of the bread were a little harder than I would have liked. However, the inside was still delicious. John, who enjoyed his slices toasted with butter, awarded the recipe 4 stars. I, who ate my slice plain, gave it 3 stars, but I am open to upping my rating in the future when I use the correct amount of banana and do not leave it too long in the oven. 1. Preheat the oven to 350°F. Spray a 9×5-inch loaf pan with cooking spray. 2. Spread the pecans on a baking sheet and toast in the oven until fragrant, about 8 minutes. Set aside to cool. 3. In a large bowl, whisk together the flours, sugars, baking soda, baking powder, and salt. 4. In a medium bowl, whisk together the oil, yogurt, eggs, and vanilla. Whisk in the bananas. Stir the wet ingredients into the dry ingredients, mixing just enough to combine them. Stir in the toasted pecans. 5. Pour the batter into the prepared pan. Bake until a wooden skewer inserted into the center comes out clean, 50 to 55 minutes. Allow to cool in the pan for 15 minutes, then transfer the bread to a wire rack to cool completely before slicing. Yield: 8 servings (serving size: one 1-inch-thick slice). Per serving, 8 PointsPlus.